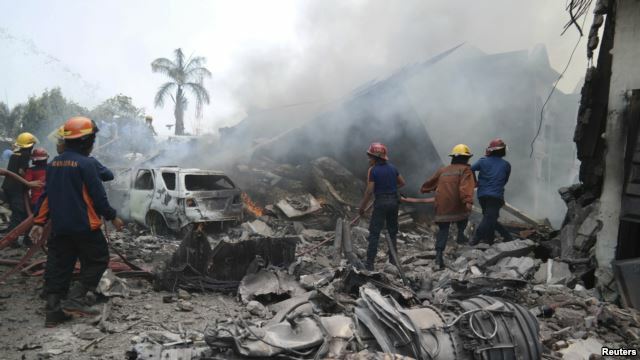 Indonesian officials say at least 30 people were killed when a military transport plane crashed into a residential neighborhood on the island of Sumatra. The Hercules C-130 slammed around midday Tuesday into two houses and a hotel in the town of Medan, Indonesia's third-largest city. Pictures from social media showed the downed aircraft in flames, with thick black smoke emerging from damaged buildings and destroyed vehicles. A military spokesman said 12 people were on board the four-engine turboprop aircraft when it went down minutes after taking off from a nearby airport. Local media have reported the plane crashed after attempting to turn back to the airport because of unspecified technical problems. Indonesia's military has suffered several deadly airplane crashes in recent years, including in June 2012, when a jet crashed into a Jakarta housing complex, killing 11 people.